I added some color and texture to the kitchen with this vintage Turkish runner. cabinets - Hi! Love the kitchen! Do you know the brand and door style of the cabinetry? Thank you! The cabinets are Homecrest. The island is their Hickory Chestnut finish and the wall cabinets are a maple cabinet, with the Alpine paint finish. I don't remember what they called this door style, but it is a typical shaker door style so if you say that any cabinet maker will know what you're referring to. 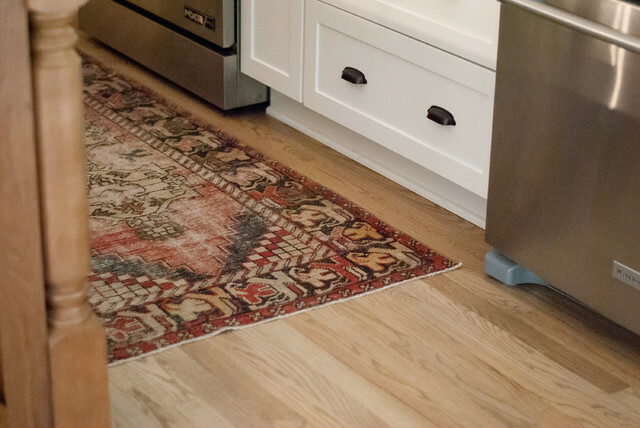 An antique kilim rug runner adds a dash of color to the white, wood and stainless steel space. “Details like the vintage runner add to the organic feeling,” Taghehchian says. can we find antique (used) rugs which aren't too pricey? This is close to the time of wood tile we are going with Chris: This will look very nice. I would suggest a staggered layout so It looks like a natural wood floor. We can do a small grout lines which will also help.